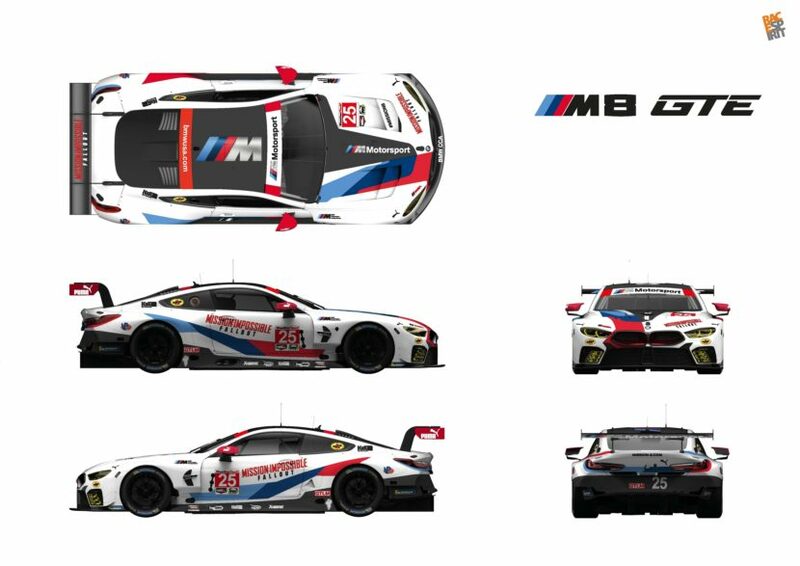 BMW Team RLL is heading to Lime Rock Park where the BMW M8 GTE will race in the first event of the second half of the 2018 IMSA WeatherTech SportsCar Championship. On July 21st, the Northeast Grand Prix will be the host of a special unveiling, as the number 24 and number 25 cars will be wearing a special livery. BMW and the Mission: Impossible franchise joined forces once again and the two racers will be dressed up in a special Mission: Impossible – Fallout livery. The “Mission: Impossible” partnership between BMW and Paramount Pictures, which dates from 2011, has already provided movie fans with several classic moments of cinematic history. The BMW brand has been meaningfully integrated into the stories of each film, showcasing forward thinking technologies and concepts that have helped the IMF agents successfully complete their missions, from Vision concepts to the current BMW M3, the BMW brand has become a part of the movie franchise. With two pole positions and two second place finishes at Sebring and Mid-Ohio, the M8 GTE has led the GTLM field at times, but the four other races in the first half of the season have seen both cars register disappointing finishes. The high speed centrifuge that is Lime Rock Park should be the catalyst required to begin the season’s turnaround. “It’s always a challenge to have a problem-free or contact-free race at Lime Rock Park, but we have been successful there in the past,” said Bobby Rahal, Team Principal. “I am looking forward to returning to Lime Rock. While a very short track, it has some very interesting corners. I think the characteristics of the M8 versus the M6 should put us in a more favorable position to challenge,” said Alexander Sims, driver No. 25 BMW M8 GTE. The Northeast Grand Prix will take the green flag at 3:10 p.m. ET on Saturday, July 21 and be broadcast (delayed) on FOX Sports 1 from 4:00 – 7:00 p.m. ET .